Is it safe? This week on NFB.ca, we dared to look at films that celebrate the coming of spring. You all felt it, right? Beneath the sub-zero temperatures and snow and rain and ice? Winter is on its way out and spring will be here any minute now. I promise. I think. I hope. March 28 is just around the corner and nothing says spring like opening day. This year marks the earliest opening day in history, and I’m praying Mother Nature gets the hint and follows suit. In this classic doc, we follow one Canadian baseball player through the 1972-1973 season – Ferguson Jenkins. Jenkins was one of the greatest players this country has produced and it’s a treat to get behind the game and catch a glimpse behind scenes… and on the mound. Newly released to the general public online, this animated short from 2017 is about one young girl who dreams of leaving the family nest in search of self-fulfillment. In her first animated short, artist Keyu Chen uses fine lines and fluid transitions to tell her story. The result is a beautiful and delicate film that’s sure to touch all audiences. The return of spring also marks the beginning of springtime rituals for wildlife. This short documentary focuses on the swift fox, one of many animals suffering from the cultivation of the prairie grasslands. The film introduces a program that was put in place to reintroduce the swift fox into its original habitat in Alberta and Saskatchewan. It also has a thing or two to say about the delicate balance between human and wildlife use of the environment. You knew this was coming, right? Because we can’t welcome spring without including a film from Bill Mason. 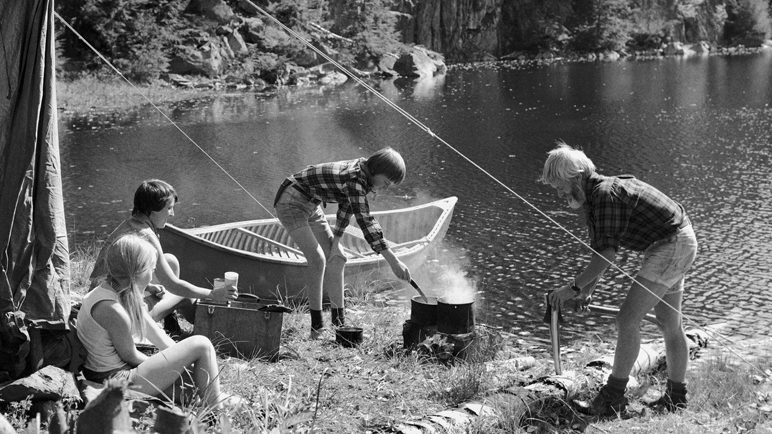 This classic joins the entire Mason family as they camp and canoe through the Ontario wilderness. As only Mason can, he transmits the pure joy and elation that the outdoors offer. It’s amazing and inspiring how he finds beauty in the simplest of things.